Little bigger than a Robin, this summer visitor to Britain is mainly found in deciduous woodland. It usually spends April to September here before flying south for the winter. 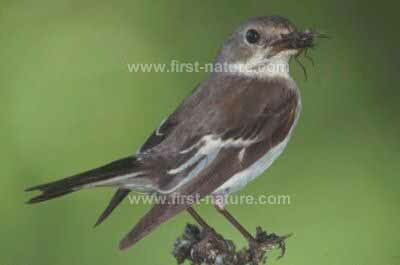 The picture shows a male Ped Flycatcher in its summer plumage; the female (shown below) is brown and white, as is the male in autumn just before it migrates to warmer southern climes; however, at that time they tend to remain high in the tree tops and are rarely seen. 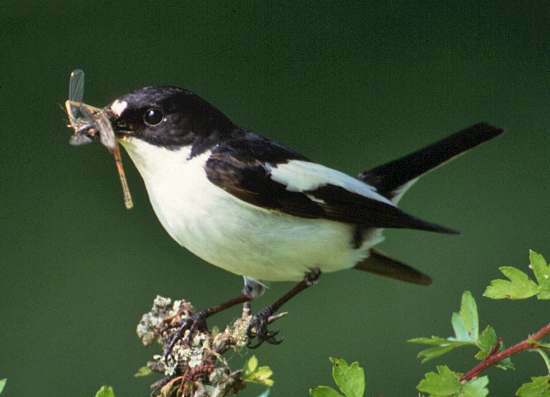 Nesting usually in holes in trees or on weathered brick walls, Pied Flycatchers will also make use of nest boxes in gardens. They usually have one batch of between four and seven pale blue eggs. Winged insects are their main food source. Both adults feed the young, and after the young birds leave the nest the adults and the young usually move well away from the nesting area and keep to the upper canopy when feeding.